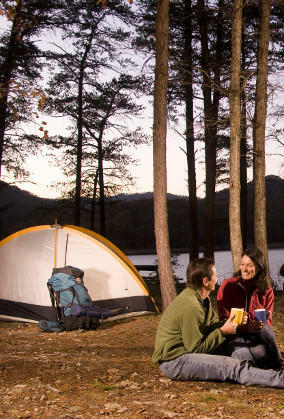 Camping in the Blue Ridge Mountains is a great way to spend your next vacation! Are you a campground gourmet or do you prefer a primitive experience where it&apos;s just you and nature? 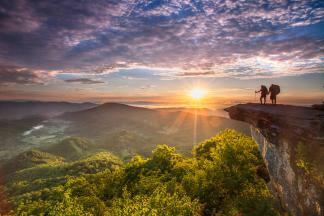 In the Roanoke Valley in Virginia&apos;s Blue Ridge, you can have it all with your camping adventure. After all, sharing a meal with the special people in your life is what puts the fine in fine dining, and s&apos;mores around a campfire can be a sweet ending to a fun-filled Blue Ridge Day. Virginia&apos;s Blue Ridge offers campgrounds with all the luxurious amenities, such as wi-fi, laundry facilities, and RV hook-ups, or you can go the more primitive route and live among the wild at some of our more remote campground facilities. The campgrounds are easily accessible from many of the great attractions and entertainment offerings of the area, and you&apos;re never too far from a delicious restaurant in the Roanoke Valley. Camping is also a great option at our three Virginia State Parks. No matter where you are in the region, when the sun goes down, you can relax and reconnect with loved ones and let your worries drift away with the evening breeze. And with the serenity of the Blue Ridge Mountains, you can fall asleep as you look up at the beautiful starlit sky. Waking up to the soothing sounds of nature will have you excited for a day full of fun in Virginia&apos;s Blue Ridge. If you&apos;re interested in something a little more structured, we also have a fantastic selection of cabins in the Blue Ridge Mountains. The following is a list of campsites and campgrounds in the region. Follow Virginia&apos;s Blue Ridge&apos;s board Outdoor Adventures in Virginia&apos;s Blue Ridge Mountains on Pinterest.